It is easy to miss the fact that many of Pope Francis' teachings on the limits of capitalism have been said before by more conservative Popes. What is new is a return to the "humane" leader we last saw in Pope John XXIII. And in the Catholic Church as we have come to known it under recent Popes, this is radically new. All the way from the choice of the name by which he is known to the style of life he has chosen. It is a rebuke to a church which has been too comfortable with wealth, too satisfied with links to the established order. 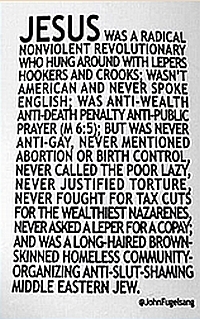 And it is most welcome - whatever views one may hold of the historic figure of Jesus. Re: Jesus, Santa, and Now Sound of Music's Mother Abbess? While well-intentioned, I think this article misses the most cogent point in all of this: Why are people reading "race" onto McDonald's representation of Mother Abbess? There was nothing "black" about McDonald's performance; Rather, it was a black woman playing a role in a work of fiction. Regardless of the historical events informing "The Sound of Music," the fictional production is just that: Fiction. I remember when some folks were bothered about Denzel Washington playing Gray Grantham in the film version of John Grisham's novel, "The Pelican Brief." There was nothing "black" about Washington's representation of Grantham: It is not as if Washington was on screen with a fried chicken wing hanging out of his mouth, doing the "Electric Slide" while humming a Marvin Gaye tune. The sad thing in all of this is that most white Americans--"left" and "right"--are incapable of engaging in what Samuel Taylor Coleridge called "willing suspension of disbelief" when it comes to "race" in cinema/television. no mention of socialist and independent election wins in Seattle and Lorain Ohio. I guess socialists are not "progressives" to NPR. Could a Sander's campaign push Hillary to the left...even a little bit? My very first gig was with Dave Van Ronk who made it possible....We played in Philadelphia and the place went bankrupt the 2 weeks we were there....Never got paid...but it was a time of wonder and joy for me...This laughing smile is how I remember him most....I agree with her take on those days so long ago in the 1960's....Music was food...food was more music.. Thanks - it was good to see this and am sending it on to friends. It is a film I want to see, even if it is imperfect. I knew Dave many years ago before he was a folk singer, remember going with him (and I think his buddy, Tom Condit, who later moved to California and became a force in the Peace and Freedom Party) to the monthly Italian anarchist dinner. And I remember that Dave joined the Young Peoples Socialist League (and took a rather sectarian position there). Teri wouldn't remember (nor would Dave, for that matter), but she was a stunning person, and Dave was lucky to have her help with his career. Her take on the movie is probably right - not having seen it I can't judge - but the music of Dave Van Ronk is wonderful. I have several of his CD;s and am always a little baffled when friends don't know his name, let alone his wonderful music. Whatever happens to the movie - may Dave Van Ronk's music live forever. Thank you for this article. As a folksinger in the Village in the early 6o's there was a definite connection with this film. And I must agree with the author. My husband was a great fan of Dave's and we met him years ago when he played McCabe's in Santa Monica. At that time my show biz and ballet career had ended and I used his version of "Swing on a Star" as a theme for my kindergarten class in LA Unified. It was our theme. The kids loved it, learned it, and performed it an assembly. Even the Principal and the parents loved it. Now that I'm approaching 70 as a widow orphan, remembering those wonderful heady days of standing for Cuba, marching for Civil Rights and against war and nukes was the best holiday gift ever. PS. We used to call Dave, behind his back, Dave Von Rank! What a great guy! I want to say thank you for your open letter. I worked for Bob Moses in Mississippi and helped organize various film screenings of the Freedom Song movie in Jackson, MS. My students in the Young People's Project even wrote a story that was put on TNT s website for a while. Reading your words brought back these memories of Mississippi. I met you briefly at Mississippi State when you spoke to a group of young people. I am from Louisiana, and I am often embarrassed because of shows like Duck Dynasty and shows that depict us southerners as unintelligent or slow. However, when I caught my first glimpse of the show, I expected that one or more of the group would be racist based on accent and attitude alone. Was I wrong for assuming, yes. Was I right with the assumption, yes. I teach Race and Culture Education at a Predominantly White University in the MidWest. Your statement regarding 'the pain many Whites caused Blacks going unnoticed even today' will make it to my discussions of race (with you cited). I find that many White students in their late teens and early 20s continue being 'Blinded by the White(ness)' of history and the skin they are in. Sadly, this form of blindness affects Blacks and other marginalized people all over the world when it come to understanding being Black in America. Because of your work and the work of Phil, Bob M., Dave, Vincent, and countless others, I move with confidence with the work I do. Bob Zellner, a great organizer, still. What this country needs is a single-payer, universal health insurance system such as the Canadians have. Full coverage--everybody in, nobody out, full choice of doctors and hospitals, paid for by progressive taxation. The Affordable Care Act is an enormous give-away to greedy insurance companies and an insult to American working people. By contrast, HR 676--the National Health Insurance Act, originally sponsored by Dennis Kucinich of Ohio and John Conyers of Michigan--called for the gradual phasing out of for-profit health insurance, which is the very industry that caused the healthcare crisis in the first place. I call on Portside to support American working people instead of the sick, pathologically greedy directors and major shareholders of the top U.S. medical insurance companies. I wish all a Happy New Year with this essential, persuasive and well-written piece. (Please don't be put off by the first sentence in the body of the article!) I especially recommend it for relatives and friends who have a background in business and finance. These bastards ( and FedEx) were the ones behind strangling the US Post Office profits by writing the legislation that forced USPS to pre-fund their pension fund for 75 years! And now Congress is trying to downsize them so that their corporate whore masters can privatize them. I knew Hollywood after WW II was controlled by Commies and that It's a Wonderful Life was a Commie film, but I was unaware that Buck Privates Come Home was a Commie film, although I should have been suspicious of that comedy team of Abbott, Stalin & Costello. In the Haydn Shaughnessy brief article from Forbes, his second paragraph says (it's not clear whether he is paraphrasing British Prof. Daniel Miller or giving his own interpretation): "Teenagers are gravitating instead towards like Snapchat and Twitter, the former because interactions leave no permanent record..."
In his third paragraph, Mr. Shaughnessy continues: "Teens don't appear to be migrating away from Facebook as a statement against data gathering or privacy intrusions." They may not be making "a statement" about privacy, but it does seem to me that not wanting to have a permanent record retained sounds exactly like they're not too happy with the data gathering or the intrusions on their privacy. Interesting story . . . but this is not news. Neural networks have been in development for decades. I personally worked with various versions of such since the early 1990's, and also with evolutionary / genetic algorithm driven systems, which not only "learn" from their experiential events but also could evolve their own strategies for learning. Why is this suddenly "news" now??? Not to discredit the author here, but this seems to be more of a publicity stunt and free advertising for Google, than it is anything to do with something radically new or revolutionary. Sadly, many current so-called science and tech journalists in the mainstream media may have their impressive sounding journalism degree . . . but have very little, if any actual background in the science and technology about which they write. Niilo was never a man to rest at ease very long -- and he always Kept Fighting. I'm sure, wherever he is, he's a very busy guy. The Abraham Lincoln Brigade Archives is forming an Abraham Lincoln Brigade Community consisting of all those who have an interest in continuing to educate future generations about the Spanish Civil War. This initiative will aid in the recuperation and preservation of the collective history of both the Spaniards and Internationals who fought fascism. Our aim is to insure that the contributions of the Abraham Lincoln Brigade will not be erased from our history. Many of you have memories of the parents, aunts, uncles and close friends who were engaged in the Spanish Anti-Fascist War or who worked tirelessly to raise funds for ambulances, medical supplies for republican Spain, and later aided the Spanish exile community. Others have discovered the ALB through life experiences. As the last of the Lincolns pass the torch to us, ALBA is committed to involving, honoring, recording and archiving our generation as well. 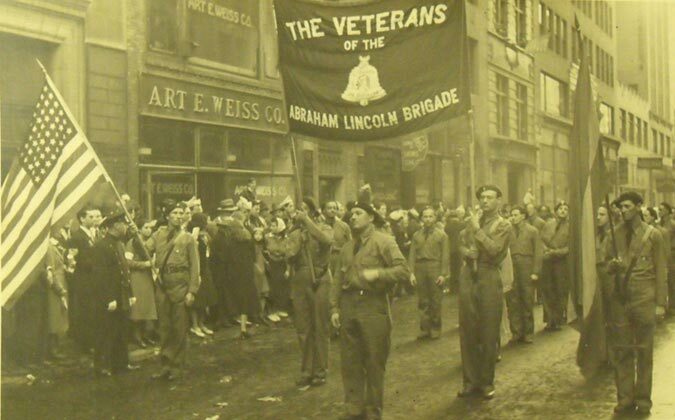 Tell us how you came to be involved in supporting and sustaining the glorious legacy of the Abraham Lincoln Brigade. Please post this to other groups whose members may have a connection to or an interest in the Abraham Lincoln Brigade Community.